Welcome to Glendon Place – a cross-stitch and counted thread design company offering unique and finely-detailed charts for the most discriminating stitcher, as well as the occasional needleart enthusiast. Glendon Place offers designs in a variety of topics, which means you’re sure to find something you like and just can’t live without! Some designs simply require ordinary floss and a solid color of fabric, while others are more challenging and suggest using an over-dyed fabric, and may incorporate variegated floss, metallic braid and embellishments such as seed beads, buttons or glass/crystal treasures. Choosing to stitch a Glendon Place design will result in a needleart piece of heirloom quality that will be enjoyed by you, as well as family and friends for years to come. WOW … LOOK WHAT WE FOUND! We are so excited to tell you that we discovered a handful of the 2018 Limited Edition Kits “Stand For Freedom” and we are making them available to you while supplies last! There are only a few (28ct Linen) kits left. AIDA IS SOLD OUT! So if you missed out last year, here is your second chance! Don’t wait too long, they are going to sell fast! BRAND NEW! The 2019 Nashville Needlework Market Cookbook is a compilation of tried-and-true recipes from your favorite designers and store owners! The book not only contains some of our favorite recipes, but also recipe history, family photos and special memories! Glendon Place has 2 recipes in the book: Authentic Spanish Black Beans (taught to me by my mother-in-law) and good old-fashion Slovak cookies called “Kolacky” or what I fondly refer to as “kolatchkies”, and old family recipe of my grandmother’s! Get lots of yummy recipes that are perfect to whip up and take to your next stitch group gathering! Available for purchase online March 1st 2019. For those of you that pre-ordered the Limited Edition, mailing of your order will take place the week of March 4th, once I return from the Nashville Needlework Market. A special thanks to all of you who supported this Limited Edition. 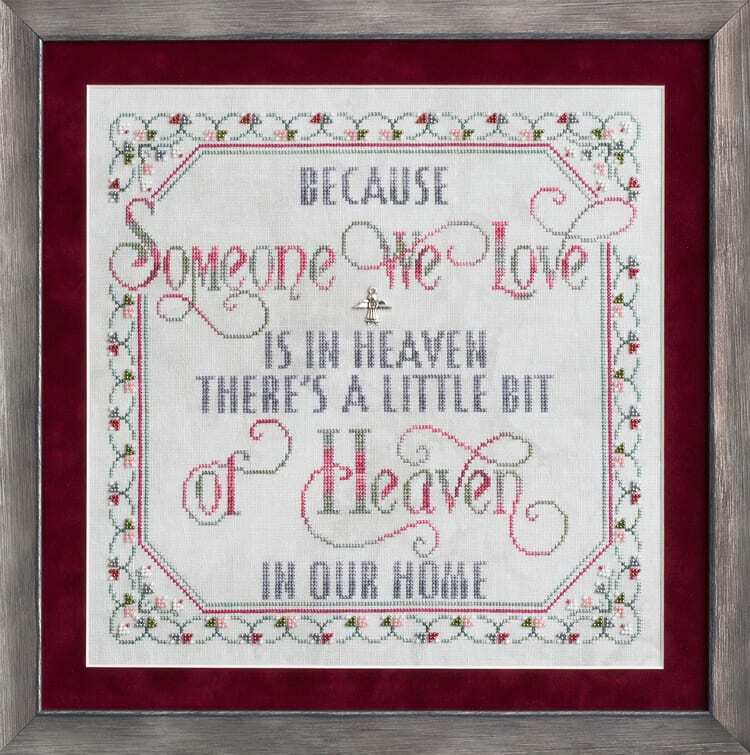 I hope it finds a very special place in your home, as well as in your heart! New Designs Released at the 2019 Nashville Needlework Market! GP-257 Phantom Plantation A new plantation-style haunted house set in swampy surroundings, complete with a skeleton horse pulling an old-time carriage, a creature emerging from the swamp, ghosts swirling around and ravens perched in the creepy moss-covered trees! Release #2 in the new Floral Mandala Collection and an excellent complement to Helianthus (the Sunflower Mandala). GP-260 Boo Elegance A smaller, glitzy, more classy Halloween design, featuring the word “Boo” written in Old-English style letters, surrounded by a purple curly-filigree, a silver spider web and a black widow spider! 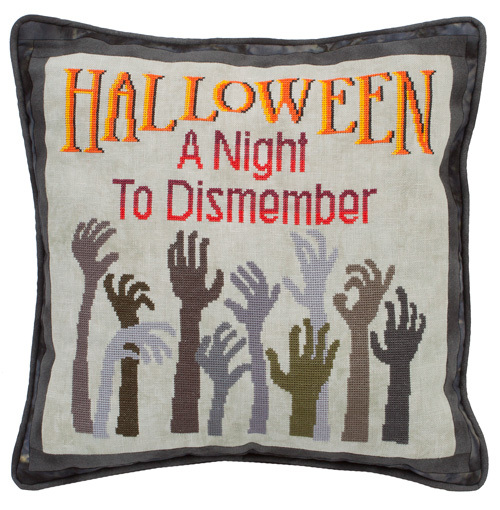 GP-262 A Night to Dismember Everyone knows that Halloween is a night to remember, but others might say it is a “night to dismember”. A graphic example of arms and hands reaching from the earth … totally ghouly! You will find design details in the Catalog section by category. Click on the individual designs and you will have access to very detailed information about the materials needed for a design. Most of the shops listed in the Shop Locator section have these materials on hand or are more than happy to order them for you. I invite you to spend as much time as you like browsing and hope that you enjoy your visit! If you have any questions or would like to join the online mailing list, just enter your email address in the space to the left (Mailing List block). Joining gives you “a first peak” opportunity at new Glendon Place designs as they are released. As always, we would love to hear your feedback anytime you have comments or suggestions. Have you visited The Stitcher’s Village lately? In case you don’t know, The Stitcher’s Village (fondly referred to as TSV), is a global needle arts community. Think of it as a cyber village with shops, a tea room, library, school, and travel agency. A place for all stitchers – xstitch, knit, needlepoint, etc. – to learn, shop, take classes with the world’s favorite needle art designers, catch up with friends in the forums, discover, play and JUST HAVE FUN!